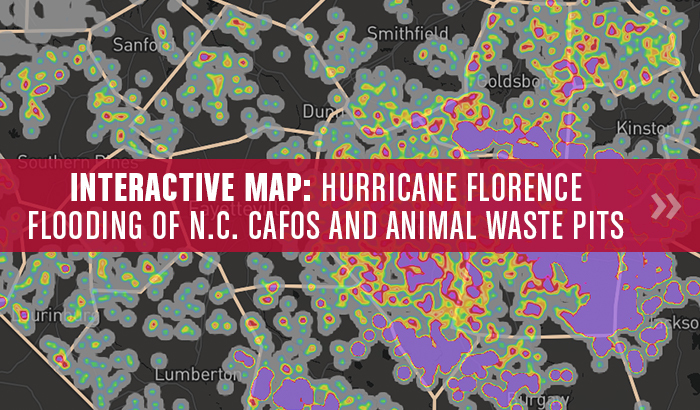 This week EWG and our colleagues at Waterkeeper Alliance analyzed flooding data following Hurricane Florence and identified 1,500 concentrated animal feeding operations, or CAFOs, and 1,000 animal waste pits that were in the storm’s path. These facilities are capable of generating or storing billions of gallons of liquid manure and urine, raising the risk of polluting nearby waterways. Take a look at our interactive map to see the flood data overlaid atop these factory farm operations. EWG also released a report detailing the outsize financial burden that many small water utilities bear when it comes to removing nitrate contamination from their customers’ drinking water. EWG analysis shows that nitrate, a chemical in commercial fertilizers and manure, was found at levels above what the National Cancer Institute says can increase the risk of cancer in the supply of 1,700 U.S. water systems. The Trump administration continued its onslaught on children’s health. The Environmental Protection Agency proposed scrapping a rule that significantly reduces mercury pollution from coal plants, deleted from a draft rule language on the threats to children’s health from climate change, and tapped a former Koch Industries executive to be the agency’s head of research. We criticized the Food and Drug Administration’s inexcusable failure to test oats and wheat products for residues of the weed killer glyphosate. After hiding its glyphosate test results for a year, the FDA said it was found on two-thirds of corn and soybean samples. But Americans’ greatest exposure to glyphosate on food comes from oats, as EWG’s recent tests of cereals, oatmeal and granola showed. Details of Supreme Court nominee Brett Kavanaugh’s previous environmental rulings have come to light. During his testimony, Kavanaugh stated that as a federal appeals court judge, he ruled in favor of the environment on “many” occasions. But we pointed out one major ruling that calls his whole environmental record into question and compared his penchant for bending the truth with that of former EPA head Scott Pruitt. Some good news: EWG applauded Congress for passing legislation to give airports the option to use firefighting foams that do not include the highly toxic fluorinated chemicals known as PFAS. PFAS chemicals in firefighting foams are a significant and widespread source of drinking water contamination. EWG was crucial in the passage of this provision, meeting with members of Congress and their staff to detail the extent of the national PFAS crisis and tout the alternatives. Finally, we updated our investigation into city slickers who collect federal farm subsidies and gave parents helpful tips to get rid of bed bugs without using harmful chemical pesticides. For decades, cities and towns in California and the Midwest, where much of this pollution is concentrated, have tried to clean up their water—for a high price. Now, an Environmental Working Group report has found that the brunt of this cost falls on small, rural communities, where a disproportionate amount of residents are living in poverty. Nitrate contamination in public water systems is a widespread problem across the country, but the scourge is really taking a toll on small communities that may not be able to pay for a treatment system, according to a new report from the Environmental Working Group. A new report from the national nonprofit Environmental Working Group says the problem of nitrate contamination in drinking water is hitting small, rural communities like Randall the hardest — and they are the ones least able to afford treatment costs. High nitrate levels in drinking water is largely a rural problem that is expensive to fix, and in order to help alleviate the problem, farms should be required to implement targeted conservation practices to reduce nutrients runoff, according to a new analysis by the Environmental Working Group. Some 1,700 U.S. communities have worrisomely high levels of nitrate in their water supplies, and two-thirds of those communities, serving more than 3 million people, have no treatment system to remove it, said an Environmental Working Group report released today. In a report released Oct. 2, 2018, the Environmental Working Group (EWG) analyzed tests of public water systems and found that 1,700 communities across the U.S. regularly have nitrate levels that the National Cancer Institute says can increase the risk of cancer. Two-thirds of those systems, serving more than 3 million Americans, have no nitrate treatment process. A new analysis conducted by the Environmental Working Group says high nitrate levels in drinking water is largely a rural problem. They want farmers to be required to implement conservation practices to reduce nutrient runoff. In their study, EWG also said about 70 percent of communities in ten states including Nebraska have nitrate levels of 5 parts per million or higher. Nebraska Farm Bureau’s Director of National Affairs Jordan Dux says that 5ppm is much less than the federal requirement of 10 ppm. The Environmental Working Group estimates more than 1,500 drinking water systems may be contaminated with the chemicals, which were used to make Teflon and other everyday products such as pesticides, carpet and gum wrappers. Their use has been phased out but the compounds remain in the environment for decades and are not regulated. Reprinted by 68 media outlets. Melanie Benesh, a legislative attorney with the Environmental Working Group, says Senator Gary Peters was leading the charge to get this bill passed. “We’re just really happy to see congress come together in this bipartisan way to address a real public health issue,” Benesh said. Benesh says some airports in other countries are already using PFAS-free foam. Pacific Standard: What Will Happen Now That the Farm Bill Has Expired? “While it's too soon to tell whether this farm bill should be dubbed the greenest farm bill ever, the Senate bill is clearly far better than the House version of the farm bill, which cuts conservation spending by nearly $1 billion,” the Environmental Working Group said in its analysis. MindBodyGreen: 5 Things You Need To Know Today (October 1, 2018) – Care about organic food? You'll want to know about this. The Environmental Working Group, along with popular food companies such as MegaFood, Ben & Jerry's, and Stonyfield Farms, have petitioned the EPA to place stricter bans on the pesticide glyphosate, the most widely used herbicide in the world that has been associated with potential health risks. The EPA's legal limit on glyphosate residues in food is 30 parts per million, and these groups want to see that number get down to 0.1 ppm. Hurricane Florence’s torrential rains pelted areas of North Carolina that are home to more than 1,500 industrial animal operations with more than 1,000 nearby animal waste storage cesspools. These operations have the potential to annually produce as much as four billion gallons of wet swine waste and 400,000 tons of dry poultry waste, according to an exclusive analysis by EWG and Waterkeeper Alliance. In 2016, the Environmental Working Group (EWG) and the Waterkeeper Alliance unveiled the extent of waste lagoons in North Carolina, which is the second biggest hog-farming industry, and the third in poultry production, in the U.S. Their analysis revealed waste pits covering over 6,800 acres, with many of them located near low-lying bodies of water. The USDA has refused to identify farmers applying for or receiving the bailout checks. The nonprofit Environmental Working Group (EWG) has filed a Freedom of Information Act (FOIA) request for those records. “One way or the other, EWG plans to get this information so that taxpayers who are paying the tab know where their money is going,” the organization said in a statement. Reprinted byYahoo! News. Scott Faber, senior vice president for governmental affairs at the Environmental Working Group, argued in a Washington Post story online that the fact U.S. Senators are eligible for bailout funds shows the program is flawed. The program has an annual income cap of $900,000; U.S. Senators make $174,000. Reprinted by the Waterloo Cedar Falls Courier and 31 other media outlets. The screening will be followed by a panel discussion which will include Environmental Working Group president and co-founder Ken Cook and Catawba faculty member Dr. Sue Calcagni. The panel will be moderated by Dr. John Wear, executive director of the center. The groups said the EPA isn’t taking enough steps to get the full picture for asbestos. Sufficient levels of exposure to the fiber can lead to lung disease and cancer, according to the EPA. The six groups include the Asbestos Disease Awareness Organization, American Public Health Association, Center for Environmental Health, Environmental Health Strategy Center, Environmental Working Group, and Safer Chemicals Healthy Families. The petitioning organisations are the Asbestos Disease Awareness Organization (ADAO); the American Public Health Association (APHA); the Center for Environmental Health (CEH); the Environmental Working Group (EWG); the Environmental Health Strategy Center (EHSC); and Safer Chemicals Healthy Families (SCHF). The Asbestos Disease Awareness Organization (ADAO), American Public Health Association (APHA), Center for Environmental Health (CEH), Environmental Working Group (EWG), Environmental Health Strategies Center (EHSC) and Safer Chemicals, Healthy Families (SCHF) filed the Sept. 25 petition with EPA, asking the agency to undertake a Toxic Substances Control Act (TSCA) section 8(a) rule to amend CDR. Benzene, ethylene, and xylene are a few common VOCs to look out for on cleaning labels and detergents. Avoid them by opting for these cleaners that score low in the Environmental Working Group's database for chemical toxicity, using eco-friendly detergent, and choosing low-VOC or VOC-free paint. Nneka Leiba, director of Environmental Working Group’s (EWG) healthy living science program, proposed some thought-provoking questions on the subject in an interview with HuffPost. “If something is naturally derived, but then synthesized with chemicals of concern, does that still make it natural? Or, at that point, has it been synthesized so much it’s no longer natural, and you’ve added chemicals of concern?” she asked. Reprinted by Yahoo! News. The U.S. has only banned 11 ingredients [from personal care products], while the E.U. has banned over 1,300 ingredients. We look to the Environmental Working Group as well as to our chemist and many other guidelines as to what ingredients we should use. WXXI News – NPR Affiliate (Pittsburgh, Penn. ): Many hair care products for African-American women are toxic. That’s changing. Nneka Leiba has been leading a survey of ingredients in products at the Environmental Working Group. They focused some of the research on hair products marketed to African-American women. “Less than 25 percent of the products we assessed scored in the green range, meaning low toxicity,” Leiba said. There is more: “Every single ingredient has a top rating on the EWG [Environmental Working Group] Skin Deep Database,” says Gooley, who eschews synthetic fragrances, toxins, sulphates and parabens in her vegan, cruelty-free body products such as The Shave Cream, Sudsy Body Wash and Dry-Bye Body Lotion. New York Magazine: Is There Such a Thing As an ‘Ecofriendly Hair Spray’? The FDA doesn’t require fragrance ingredients to be listed out individually, so she says that could be masking dozens of chemicals. This one from Free & Clear — a brand that derms recommend a lot — is free of fragrances, sulfates, parabens, preservatives, and phosphate. It’s also highly ranked in the Environmental Working Group’s database (which, if you don’t know about it, breaks down the risk factor of all the ingredients contained in popular cosmetics and consumer products). Last weekend I attended the 25th anniversary celebration of Environmental Working Group (EWG) at the W3LL PEOPLE Studio in Austin, Texas. The Environmental Working Group (EWG) drives companies to create healthier and safer products by marking consumer products with EWG VERIFIED™. At the event, they had several products on display and samples of products that are EWG VERIFIED™ at the W3LL PEOPLE Studio. That’s where things get murky. Which is why we tapped Nneka Leiba, the director of healthy living science at the Environmental Working Group. In her monthly column, Leiba answers our most pressing concerns about toxicity, the environment, and the health of the planet. Plus, both melons are on the Environmental Working Group’s list of the “clean 15,” which is a list of the produce that’s least likely to be contaminated by pesticides, as opposed to the “dirty dozen” that are the most likely to be contaminated. “There are organizations doing good work,” said Ali, who is black. “But of all the green groups that get huge amounts of money, you don’t have one African-American or Latina leading that organization.” He was alluding to groups such as the Sierra Club, Greenpeace Fund, Environmental Working Group, Friends of the Earth, Rainforest Alliance, Earthjustice, Ocean Conservancy, and Earth Island Institute. Sunscreen doesn’t have to add another step to your routine. This one from Suntegrity is tinted to perfection and can easily be used in place of foundation. The chemical-free BB cream covers, protects and nourishes the skin. It contains power-player ingredients like hyaluronic acid, astaxanthin, red algae, aloe vera, pomegranate, cucumber, and green tea. It’s no wonder it has been rated #1 by the EWG/Skin Deep Cosmetic Safety Database. The sites are a concern because one .22-caliber bullet fully dissolved can contaminate 50,000 gallons of water with lead levels above drinking water standards, according to the Washington, D.C., nonprofit Environmental Working Group. At 2.6 grams of lead, that bullet contains less lead than larger slugs, such as those found in 9mm (7.5 grams) and .45-caliber (12 grams) rounds. A map of contaminated sites and communities where PFAS has been detected in drinking water has been compiled by Northeastern University and Environmental Working Group. Reprinted by WBUR and 10 other NPR affiliates. About 1,500 drinking water systems across the country serving roughly 110 million Americans may be contaminated by PFAS, formally known as Per- and Polyfluoroalkyl Substances, according to a recent analysis by the Environmental Working Group. About 400,000 people in the area get their drinking water from Dayton wells either through the city’s distribution system or one operated by Montgomery County. Reprinted by WRAL. Four states have adopted lower levels so far. New Jersey leaders continue to consider a 13 or 14 parts per trillion cutoff, said David Andrews, senior scientist for Environmental Working Group. EWG is a nonprofit, nonpartisan organization based in Washington. The 70 parts per trillion cutoff worries Andrews — he said it fails to consider recent studies of impacts from water containing even 1 part per trillion.